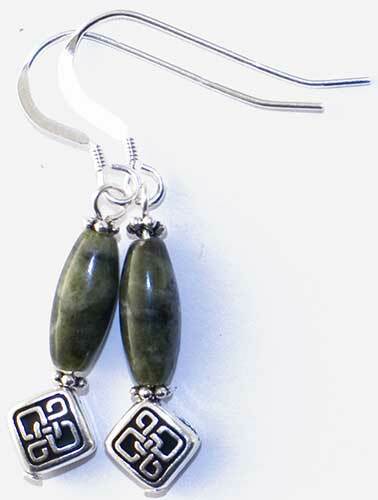 Connemara marble Celtic earrings feature silver plated knot work charms along with a long marble stones. The Connemara marble that is featured in these earrings is the only natural green marble in the world; fittingly, Connemara marble is only found in Ireland. These Celtic Connemara marble earrings feature carved and polished long stones. 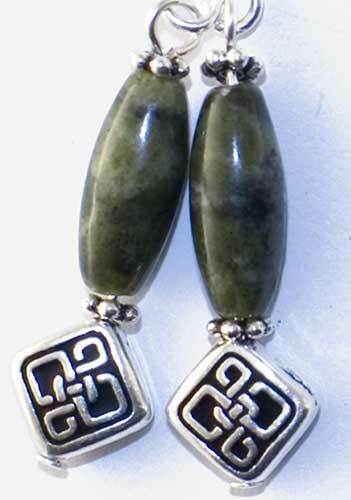 The Connemara marble earrings are further enhanced with a silver plated over pewter Celtic knot-work beads. The dangle Celtic earrings measure 1/4" wide by 1 1/2" long, to the top of the sterling silver fishhook wires. These Irish earrings are made in Kilkenny, Ireland by All That Glisters; they are gift boxed with Celtic knot and Connemara marble history cards, complements of The Irish Gift House. Connemara marble Celtic necklace features a silver plated knot work charm along with a long marble stone. Connemara marble Celtic pendant features a silver plated knot work bead along with a marble bead and a long stone. Connemara marble Celtic earrings features silver plated knot work beads along with marble beads and long stones.